VANCOUVER, Canada (January 15, 2017) -- AppBridge Software Inc. today announced the launch of its new AppBridge Transformer migration connector add-on for AODocs. 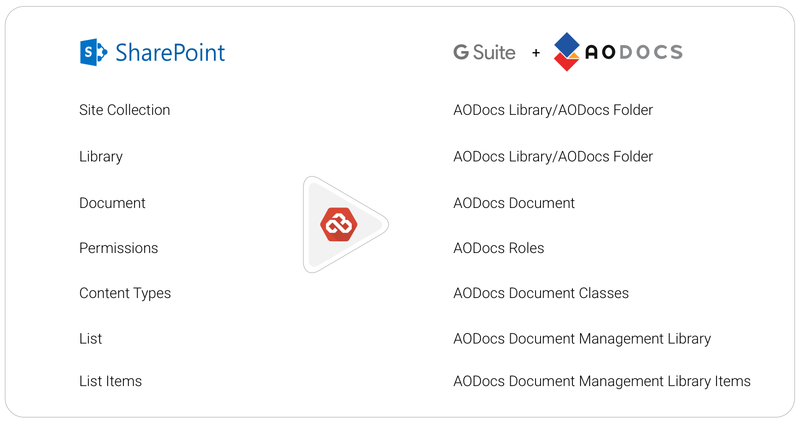 This new integration allows organizations to migrate from numerous source systems to G Suite and Google Drive and also provides the ability for them to instantly take advantage of the features of the popular AODocs enterprise document management add-on for G Suite. By combining the migration process and AODocs setup, the AppBridge Transformer migration connector add-on for AODocs greatly simplifies the task of migrating enterprise content to G Suite. 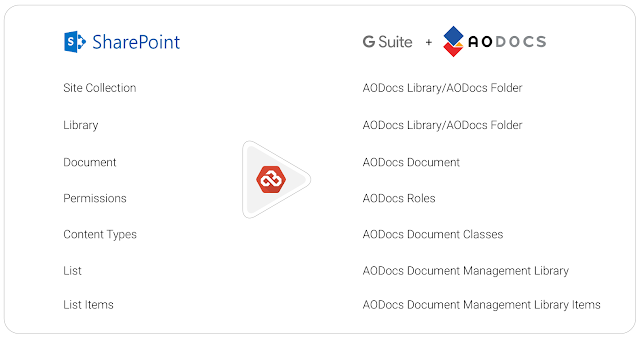 Instead of two potentially disjointed projects, end-users can get up and running with both G Suite and AODocs document management in one coordinated process. Transformer can automatically provision AODocs libraries, folders, permissions, and metadata, leading to an automated creation of an entire AODocs-enabled Google Drive infrastructure. Once the migration is complete, organizations can benefit from features in AODocs such as preventing accidental file deletion, re-sharing of files, and accidental public sharing. “We’re delighted to release our new AODocs connector in the AppBridge Transformation Suite. This new offering will please organizations migrating to G Suite for the first time and also those looking to expand their use of AODocs document management features in Google Drive,” said Cameron Wallin, AppBridge CEO. For more information about AppBridge’s support for migration to G Suite, Gmail, Google Drive, and the AODocs connector, please contact your AppBridge sales representative or email sales@appbridge.io. Starting today we are offering AppBridge Transformer migration support for the G Suite Team Drives Early Adopter Program (EAP). This offer to those in the EAP for Team Drives has the potential to provide organizations zero downtime migrations from many source systems. For more information about AppBridge’s support for EAP migration to G Suite Team Drives, please contact your AppBridge sales representative or email sales@appbridge.io. Here's a useful tip that came from the G Suite Google+ page. 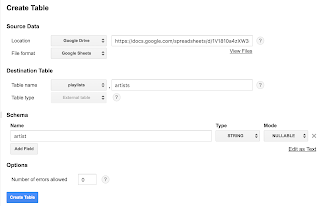 If you choose to do so, you can disable the options to download, print and copy files from your Google Drive for commenters and viewers. 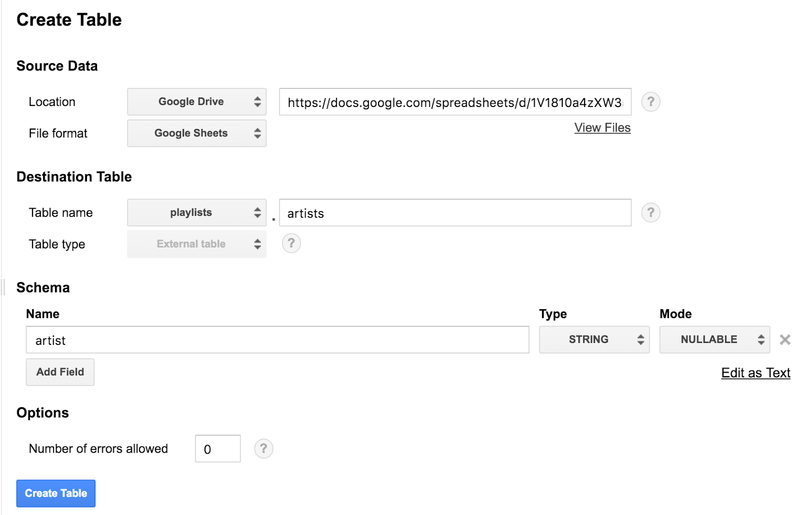 This feature provides content owners with more control over the distribution of their work. For example, you may be working on something that will eventually be released publicly, but you certainly don't want your draft material to accidentally be made available to anyone. 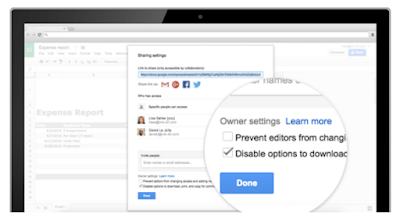 Fear not, in G Suite, you can change your Sharing Settings to lock down your work. Find the "Disable options to download, print, and copy for commenters and viewers," option and you can rest easy that you know where your content is going. We're thrilled to be featured in an article on the Canadian Federal Government website: CanExport: A bridge to international markets. The article focuses on the CanExport program which provides services to small businesses in Canada looking to reach out to customers in other countries. "Delivered by the Trade Commissioner Service (1TCS) of Global Affairs Canada, in partnership with the National Research Council Industrial Research Assistance Program (NRC-IRAP), CanExport provides financial support for a wide range of export marketing activities." Earlier this year, we blogged about our signing ceremony with our partner Densan System Co. in Japan. 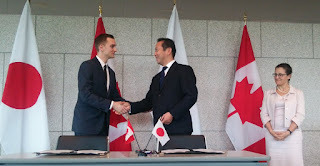 "Created in January 2014, AppBridge already had a product on the market in July 2015 and today counts international Fortune 500 companies among its many customers, in partnership with Google and ... with the assistance of the Canadian Trade Commissioner Service and its CanExport program, the firm is moving into the lucrative Japanese market as it further expands its global presence." Learn more about CanExport today. In a recent blog post entitled, Evernote’s Future Is in the Cloud (by Ben McCormack, VP Operations), the company announced its intention to migrate the back-end of it's wildly popular note-taking app to the Google Cloud Platform (GCP). 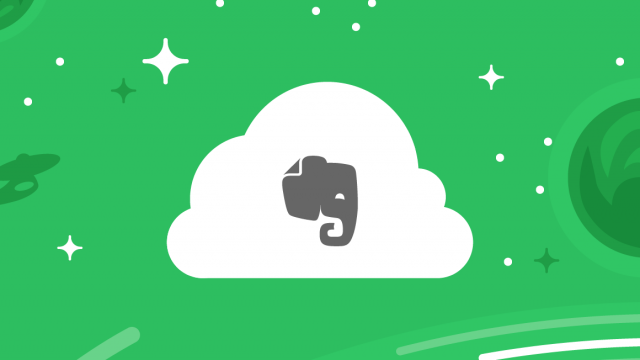 From the post: "the question was this: can a cloud service give our 200 million customers the high level of quality, performance, and security they expect and deserve from Evernote? We believe it can...With Google Cloud Platform, Evernote will gain significant improvements in performance, security, efficiency, and scalability. Moving to the cloud also allows us to focus time and resources on the things that matter most." If a successful company with over 200 million customers feels the best course is to migrate its data from in-house servers to Google servers, what does that mean for the on-premises vs. cloud hosting debate? Well, the debate has been over for a long time and railing against the cloud is not time well spent. However, there will always be a question of scale, and Evernote's decision to move to the cloud has added a valuable data point in that conversation. Essentially, it goes like this: if I have my own servers, at some scale, they have to be cheaper and more efficient than paying someone else to run and manage them for me. In the past, that ROI point was not clear--unless you happened to be Facebook. Maybe it's not perfectly clear now where the line lies, but it's certainly moved so far as to not even be an issue for most companies. Over 200 million users is a pretty high bar for that line (to mix some metaphors). Of course, those of us at AppBridge are biased. After all, we've been migrating customers to Google Apps (now called G Suite) for years. But setting aside that fact, it's still plain to see that the cloud has taken over all but the most stubborn of deployments. If it's cheaper and easier to run EverNote on cloud hosted servers, then it's almost certainly cheaper and easier to run the vast majority of applications in the cloud. And how about security? Time and again, it has been proven that the small dedicated security teams at cloud hosting platforms outperform in-house staff. In other words, cloud servers and more secure than private servers. One example is that EverNote's move to GCP will add encryption at rest for all their user's data. If this is all true for application data, then it's certainly also true for your organization's content. McCormack wrote that they didn't make this decision easily. They went through an "intensive period of research and investigation" before choosing to migrate to Google Cloud. In our experience, the same can be said for content migrations. Perhaps some will continue to argue against migrating to the cloud, but the evidence is overwhelming--it's past the time to embrace the future. Related: TechRadar argues that Google's machine learning features are a big part of EverNote's move to the Google Cloud Platform. When Google announced a new free product called Google Data Studio, I was already excited. Even though the initial May launch was a limited release, the potential of a modern, cloud-based, and mobile-friendly application to present and share data in visually appealing charts was immediately apparent. The simplest way to explain Google Data Studio is that it's a web application for data visualization--charts, graphs, dashboards, etc. It's like a simpler and more user-friendly version of systems such as Microsoft Excel services. 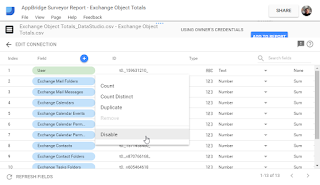 In the past, these tools were reserved for power users, but Google Data Studio is much more accessible and therefore opens up data visualization functionality to a wider user base. As an example, imagine you're a consultant migrating a large enterprise from Office 365 to G Suite (formerly Google Apps for Work). 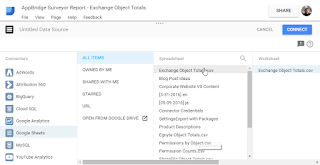 As part of that process, you're going to migrate the Exchange portion of Office 365 to Gmail. 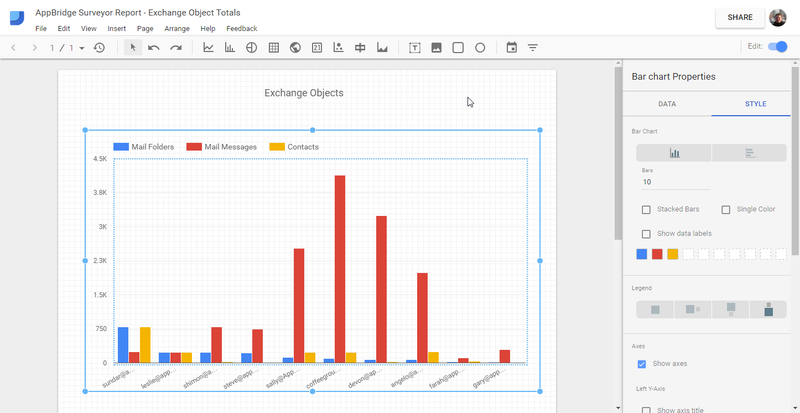 Let's take a look at a data report from AppBridge Surveyor and see what can be done quickly in Google Data Studio to present the data in a more accessible way. Surveyor is our application for scanning source systems and generating reports so you can make intelligent decisions about your migration to G Suite (formerly known as Google Apps for Work). 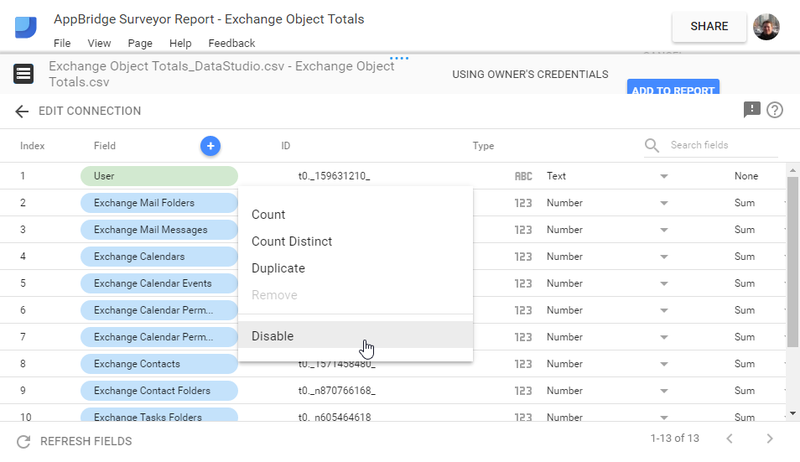 The first step is to fire up the new Google Data Studio Beta and create a new report. As part of that process, you'll be asked to provide a data source. This is one of the areas where the data studio shines. 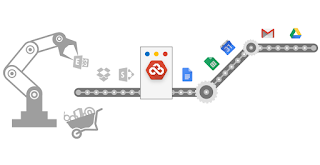 There are already a wide variety of "connectors" to choose from (e.g., Google Sheets, AdWords, BigQuery, YouTube Analytics, Google Analytics, and MySQL). Since you've already opened the CSV report in G Suite, it is available as a Google Sheet. To use the data, you simply select Google Sheet as your data source type and then browse for the report. 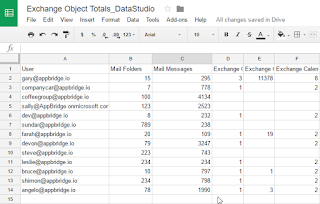 At this point, data studio will read the sheet and present you with a list of columns. You don't have to use all the data--you can choose just what you need for your impressive presentation. Once you have your data selected, you will be presented with a blank canvas for your report. In this example, I clicked the bar chart button and then drew a square on the blank page to represent where the chart will display. I also added a dead simple title just for kicks. 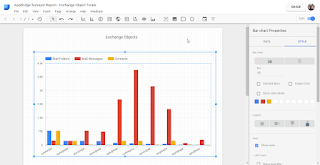 With just a few clicks, I've been able to create a shareable bar chart showing my Google sheet data. That's pretty cool, but let's go even a step further. By going into the settings for the chart, You can choose the number of bars and sort them to highlight the metric that matters to me. 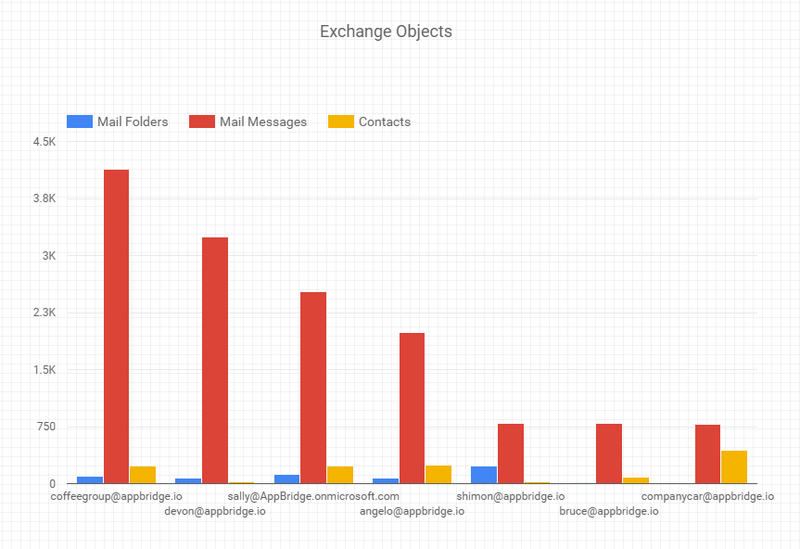 In this case, I've sorted the data by the number of email messages in each user's account. That was really easy and the results are visually appealing and informative, but the benefits don't stop there. If you've been using spreadsheets for long, you're probably thinking you could do most of this already. Sure, that's true, but since the 'backend' data is in G Suite, sharing and updating are painless. Furthermore, there's not confusion about which version of the report is up-to-date because there is only one version. The simplicity and power of Google Data Studio is impressive and you have to remember that this is only the Beta. I can't wait to see what comes in the future. Migrating to a different Enterprise Content Management (ECM) system can be a daunting task. After all, these systems (by definition) are meant to be integral to your employee's work. With this in mind, it may seem like a safe choice to put up with your current outdated systems and avoid any migration projects. However, like an ostrich burying its head in the sand, that strategy will only work for a short time. Eventually, the cost savings and added benefits of a modern ECM will be too strong a pull, and--to stay with the bird analogies--the old ECM systems will go the way of the dodo. When contemplating a migration, you clearly need to consider the opportunity cost you're paying by not switching to a system that better suits your employees and how they want to work. Today, Google Apps for Work (which has been renamed to G Suite) is used by more than 5 million organizations around the world (including 60% of Fortune 500 companies), precisely because it better fits with the modern workforce. Google Apps is a relatively new offering in the ECM space and 'new' in this case represents a more modern alternative to the ECM systems of the past. Unlike most of the other big players, Apps didn't start it's life as an on-premises application that was later shoe-horned into a cloud service. From the first day, Apps has been in the cloud and worked on modern mobile devices. The upside of migration is a tremendous opportunity to improve the end-user's everyday work experience and significantly improve the organization's data organization and employee collaboration. In this post, I'll introduce the primary questions anyone thinking of migrating to Google Apps for Work (and/or Google Drive) should explore before the migration project begins. 1. What data do we have today? At face value, this may seem obvious, but the question is far more in-depth than, "What are your Source Systems?" Most IT departments--and we're basing this on years of experience--only need to migrate a portion of their data to a new content management system. In the case of Web Content Management, they might know how many pages they have. For file storage, they should know the total volume of data they're storing, but that information is only part of the picture. To plan a successful ECM migration, you need to know a lot more about your systems and data. For example, you must understand the source and target permission systems and then find out how you're using your source systems. Depending on the type of data you're migrating, the same can be said for users, roles, files, folders, metadata, email, etc. Discovering what you have today is a vital step in planning for a data migration, so use a tool such as AppBridge Surveyor to generate reports and figure it out. Once you have the data, you can make informed decisions. 2. Which data do we want to migrate? The basis of this question is the simple fact that it's highly unlikely all of the data you have in your current source systems needs to be migrated to your new ECM platform. Yes, there are exceptions such as legal hold or regulatory compliance, but even then, it's unlikely to apply to all your data. If your organization is like the vast majority, you have a lot of data kicking around that you don't need. Many projects produce a great deal of files, but once the project is complete, those files are rarely ever needed. Even if you decide that you want to keep every byte of data you have today, that still doesn't mean you have to move it all into the new system. You most likely can archive it somewhere. A. It makes searching more difficult. I'm sure we can all remember a time we went to a search and the results returned a flood of old data. If you keep everything, it's just a matter of time before it affects your search efficacy. B. It takes up space. Space usually comes with a price, so keeping unnecessary data is not just a hassle; it might actually be costing you money. C. If you keep them around, people will accidentally use the old versions of files. This happens all the time because search generally doesn't help a user figure out which file is the most recent. Let's say--just like AppBridge--you've recently upgraded your company logo. If someone is looking for the logo and they search, will the results only show your new logo? So ask yourself (and your team), what data do you really need? 3. How can we improve the organization of our data? The fancy term for the organization of your data is "information architecture." If you're not a fan of buzzwords, you wouldn't like this one; it's used heavily in the ECM domain. You can't go to a trade show without hearing an information architecture discussion. But that's not to say this conversation doesn't have value. In the context of a data migration, you are presented with a (possibly unique) opportunity to not just move your data to a new system, but actually make it better. As already mentioned, simply reducing the outdated data you have in your content management system is one way to improve the situation. But starting with this simple question is also valuable, "Does the organization or your data match your organization and its workflow?" I don't think I've worked for a company that didn't go through some sort of restructuring, reorganization, or tinkering. Teams are renamed, offices are added, closed, or merged. In short, lots of change. Generally, the organization of data does not keep pace with the reality of how people are working. So forget about what you have today and imagine what would work best for your current reality. 4. What will our new workflow look like? When you move from one ECM solution to another, there invariably will be some changes. Some of the change might come from a conscious decision to do things differently (read: better), but a lot of the differences will be a result of the way the new system works. Even moving from one version of an ECM system to another could involve changing some aspects of users' workflow--hopefully, for the better. That's not as common these days as Agile software development has led to more frequent and less disruptive releases for many ECM offerings--especially those in the cloud. Rather than assuming that employees will follow the same workflow, a proper investigation is required on the target system. This is where a small pilot group is invaluable. After an initial review and recommendations for workflow changes, move over a small portion of your user base and have them work out the kinks in the new system before you do the full migration for the entire organization. 5. How will we prevent interruptions for our users? When discussing migration projects with people, many cite the disruption to their users as the main obstacle. It really doesn't have to be that way. I'm going to try and avoid turning this post into an ad, but if you investigate migration software, you'll find that solutions such as our own AppBridge Transformation Suite for Google Apps and Google Drive can provide zero-downtime migrations to Google Apps. Most likely, you'll want to migrate the bulk of your users during non-working hours. If you have a small enough user base and a small enough volume of data, you might be able to migrate over a weekend. However, for larger organizations, or larger data stores, that's simply not possible. Even when dealing with 'fast' networks and modern systems, there are still limitations. But none of these issues are necessarily a deal-breaker. If you're using a sophisticated migration solution, you will be able to migrate over the bulk of your data, and then migrate over anything that has changed since you began the migration (the "deltas"). This functionality allows for minimum interruption and zero downtime for users. 6. How will we sufficiently test our migration? The story goes that the original HealthCare.org project team reduced their testing period from months to weeks, and they ran their performance stress tests the day before the launch. It was the most highly publicized failed project of the century (so far), and any project manager worth their salt could have looked at the schedule and seen red flags. Testing isn't optional--it's not an add-on to the project. 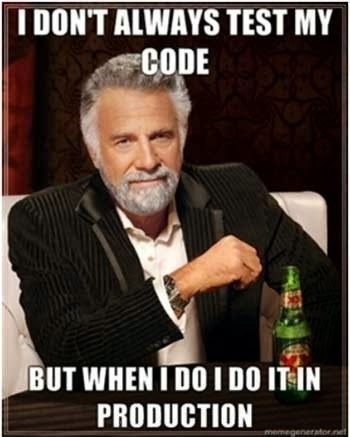 This is just as true for data migration projects. Remember the mantra: Test early and test often. 7. How will we run our user training? I assume many people would guess that the data copying phase of a migration is the most challenging. That's not necessarily true. Without proper end-user preparation and training, user adoption issues can sink an otherwise successful data migration project. Before you begin your migration--and before you begin your pilot--you should take the lessons you learned in the workflow evaluation stage and combine that with proper training on the new system. Leaving employees to their own devices can literally scare people, and that's not the start you want to your new system. Even if it's not a lot of time, give people the opportunity to try the new system with sample data (so they can do no wrong) and also the opportunity to ask questions. In large organizations, this can involve nominating people to be the 'expert' for their small team. If you have the budget, this job could be handled by professional trainers. Whichever option you choose, please don't skip end-user training. 8. What will it cost us? It's obviously impossible to give a range for migration projects; there are far too many variables. Some companies will engage outside consultants to handle the projects, others will use their internal teams. Also, there are different pricing models for migration software. Some solutions are priced by the number of users and others are priced by the volume of data migrated. The only way to figure out your cost will be to get some quotes for the services and software. One point I would like to make is that the return on investment for migration software is clear. I wrote a blog post on Why Data Migration is Challenging because there are still the occasional detractors who believe they'd be able to custom code their own solution and end up with better results. That road has been tried and over the years, we've seen many of these projects fail and ultimately result in a second project using off the shelf software. I hope you found this post helpful. If you have any questions, please feel free to post them in the comments. BTW -- I'm aware that Ostriches don't actually bury their heads in the sand; that's a myth. What they're actually doing is digging holes for their nests. With seemingly every social media platform out there switching to an "Instragram style" image view, and mounting statistics showing that image posts result in better engagement, having lots of images available for social media use has become even more important over time. However, for companies with little budget to pay image royalties, this has been a problem. Being able to efficiently find royalty images is key for these organizations. Fortunately, Google Apps is here to help. 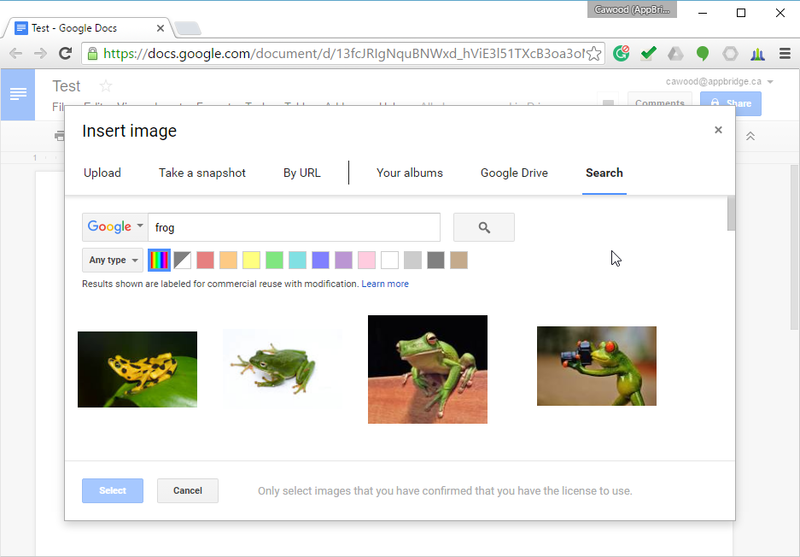 The ability to search for royalty images is built into the Google Apps Image feature. It can be a significant timesaver, and a money saver as well. To make it even easier, the search results show an image preview and you can quickly scroll through pages of results. You can also use colour or image type to further filter the results. This is super handy if you're looking not just for a type of image, but also one that matches your aesthetic. But Google Docs aren't the only way to use this feature. It's also available in other Google Apps. For example, you might be in a Slides presentation and you can insert or replace images using the same feature (replace maintains the setting you've chosen and swaps in a new image). If you think the availability of images is holding you back, try this feature and you'll be amazed at the variety of quality of royalty-free images are waiting for you. 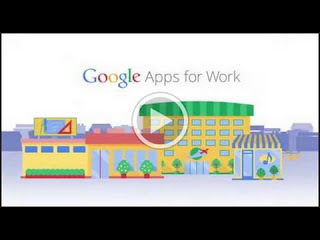 BTW -- I discovered this feature by watching the Google for Work App Show, so I'll give them a shout out. 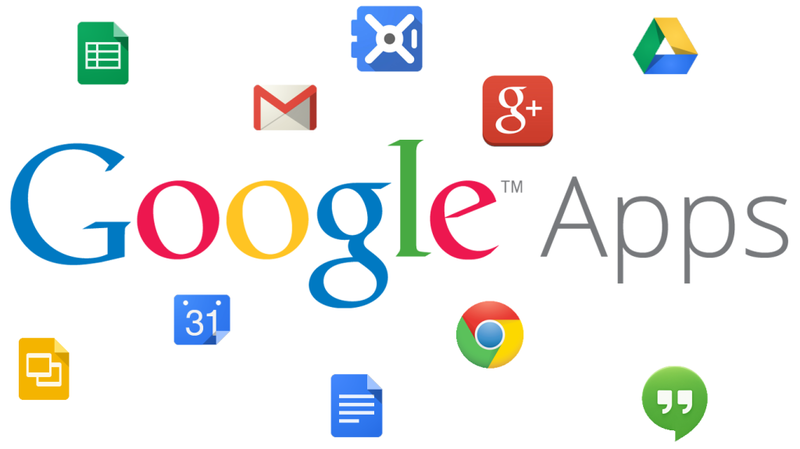 There are many lists out there of the best add-ons for Google Apps, To make it easier to find them, I thought I'd make a meta-post with a list of lists of Google Apps add-ons. A relatively new one from Appirio: What Are the Best Add-Ons for Google Docs and Sheets? One thing I've noticed about these lists is that Lucidchart Diagrams appears many times. I'm going to have to try that one. And, of course, the list wouldn't be complete without the official Google Apps for Work Marketplace and the Google Add-ons Developer page. Google recently announced that they're providing a new pop-up acceptance option for Google 2-Step authentication on Android devices. Many people are already using 2-Step (or two factor) authentication, but if you're not familiar, it's a vastly more secure option. Instead of providing a password when you use Google authentication, you need both the password and a verification code. Some systems text the code to your phone, and some (including Google) also offer an app to get your security codes. What it boils down to is that for someone to break into your account, they would need not just password, but also physical access to your unlocked phone--that's clearly a much higher bar. 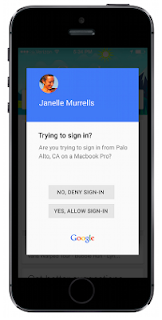 You can read about Google's version of 2-Step authentication on their site. As a big believer in the added security of 2-Step verification, I am happy about this update to Google Accounts and Android's Google Play Services. Prior to this upgrade, I would have to open the Google Authenticator app each time I used Google authentication for an app on my phone. It's not a huge hassle, but it's enough to put some people off using two factor security. Instead of using the additional app, Google is providing a pop-up acceptance option in Android. This removes the need for an extra app and makes the whole experience quick and simple. If you're not using 2-Step authentication, I highly recommend you try it out. This enhancement pretty much removes the last argument against the added security you get with 2-Step. It's hard to believe, but it's true--the world is changing fast. Google is now selling more laptops than Apple (at least is the US market that is). From the Verge article, "International Data Corporation (IDC) estimates Apple's US Mac shipments to be around 1.76 million in the latest quarter, meaning Dell, HP, and Lenovo sold nearly 2 million Chromebooks in Q1 combined." Some of the reasons for the success of the Chromebook are clear. For example, they can cost 1/10 the price of a MacBook--that's pretty compelling. Also, Google just announced at I/O that Chrome O/S will now run apps from the massive Google Play app store. 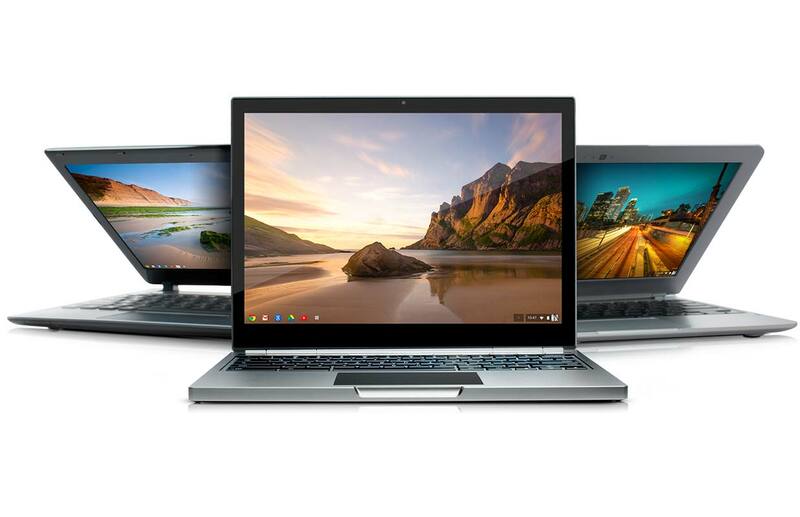 Chromebooks are simple, affordable, and getting even more flexible. They're doing extremely well in the education market and they're leveaging that success into other sectors. I've been a long time fan of the Chromebook. In 2014, I blogged about Why I Just Bought a Chromebook and then followed up with another post reviewing the Toshiba Chromebook that I'm still using today. As a Chromebook user, I'm not surprised that lots of people chose Chromebooks over the alternatives, but that doesn't make the news any less impactful. I'm sure that a random poll of people on the streets would not place Google anywhere near Apple in computer sales. Here at AppBridge, we watched the Google I/O conference announcements very closely. After all, our entire business is helping our customers go Google, so they can effectively use Google Apps. This announcement of a new Sheets and Slides API was great news as it potentially expands what we can offer in our migrations to Google Apps. From the announcement of the new Sheets and Slides APIs, "The new Sheets API is available today. Find the developer documentation as well as a codelab to help you get started at developers.google.com/sheets." For more information, check out the new Sheets and Slides APIs announcement, or watch these videos: Build seamless integrations with the new Google Sheets API and Keep data flowing between your app and Google Slides with the new Slides API. 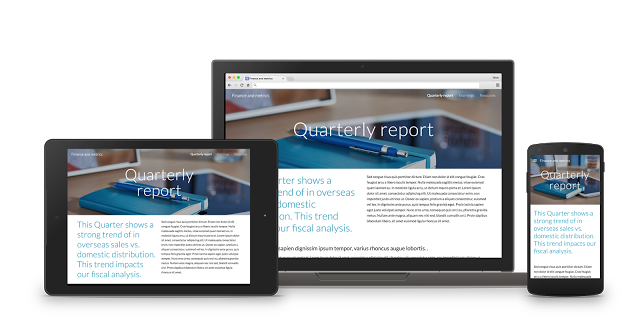 "With the new Google Sites, you can build beautiful, functional pages to aggregate and distribute content across your enterprise, optimized for every screen. A new intuitive drag-and-drop design experience supports real-time collaboration by multiple editors, just like in Docs, and offers easy access to all your content from Calendar, Docs, Drive, Maps and more. The new Sites also includes themes and layouts designed to scale and flex to any screen size, so they’re as useful when you access them on the 30-inch monitor at your desk or your smartphone on your commute." 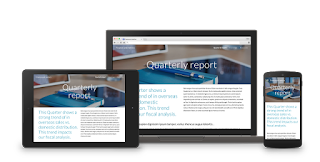 Google has clarified that the classic version of Google Sites will be functional for at least one year, and at some point, they will provide options for moving content from classic Google Sites to the new Sites. "Google is ... working on a new way to bring all of this power to the enterprise: Google Springboard. Google Springboard helps you find the right information that you need at the moment that you need it. It searches quickly and easily across all of your information in Google Apps including Gmail, Calendar, Docs, Drive, Contacts and more. Springboard also assists you throughout your workday by proactively providing useful and actionable information and recommendations." Here are the sign up links and the description of the program from the announcement: "We’ve been previewing Google Springboard and the new Google Sites with a small set of customers, and we’re excited to begin to extend each of these new apps to more customers through an Early Adopter Program. If you’re the admin of a company that runs on Google Apps for Work you can express your interest in the Google Springboard Early Adopter Program or the Google Sites Early Adopter Program. " Data migration is hard. Granted, it's not something that most people think about, and very few have actually tried it. If you haven't, you'll just have to trust us on this one; it's hard. Also, if you're a software developer who hasn't tried it, it's probably much harder than you think. Despite this fact, there are many naysayers out there who will tell you it's a breeze. They glibly point out that system A has an API and system B has an API, so there you go--easy peasy, lemon squeezy (as my daughter would say). If only it were that simple. So why is data migration complicated, difficult, and riddled with booby traps? This post outlines five of the main reasons. Before getting to the list, let's first establish that this post is about the technical challenges. User adoption can actually be the highest hurdle to a successful migration, but that's not in the scope of this post. In terms of the challenges to creating migration software, here are some of the thorniest issues we face. 5. People think it's easy so it always takes more time and effort than expected. As mentioned above, there is a general misunderstanding about data migration out there that it should be easy. This leads to many problems. One of the most common is trying to build a custom migration solution for a project. I've heard about numerous failed migration projects because the company involved quite often has to seek an off the shelf migration solution after their custom solution fails. There simply is no way to argue with the ROI benefit of licensing an existing product rather than developing your own custom migration solution. 4. Data volume and performance are challenges--especially when dealing with the cloud. Even under ideal performance conditions (e.g., running both the source and target on-premises), performance is an issue when dealing with large volumes of data. The problem is that an organization can literally spend years putting data into a content management system and then ask for that data to be migrated to a new system over the weekend. First of all, getting all the data out of a system is not the same as getting each piece out. When you try to get all the data, you (understandably) can run into all sorts of bottlenecks and intentional throttling. Even if the system has an API that allows one item to be copied out, asking that API to copy millions of things in one go can quickly go pear-shaped (more about that when we get to API issues). 3. There are a lot of file storage and content management systems out there and every company uses more than one. The reality of today's IT infrastructure is that practically every company uses some sort of on-premises file shares in addition to a content management system, and cloud-based file storage. Taking the time to write migration software for each of these systems is just not feasible. This means migration Independent Software Vendors (ISVs) have to choose which ones they feel will be the best business case. Choosing which platforms to support can make or break a small ISV business. 2. No one wants you to migrate away from their platform so no API is ever built to easily move data out of a system. Sadly, no API seems to ever get finished. This isn't because developers won't want to finish things; it's most commonly the reality of dealing with limited resources. However, it's also true that there are times when companies make the conscious decision to not provide API read access to everything in their system. By doing so, they enhance the 'stickiness' of their application. In other words, it's harder for customers to jump ship and migrate to another platform. That's one API issue, but it's not the only way. Even if the API is provided, it's built for customer use cases, not the migration use case. So those of us who try and use it for migration, find that it's either way too slow for a migration, or it simply does not work because it's incomplete or throws too many errors. 1. Data migration is often not apples to apples. When you migrate from one system to another, there are times when it isn't clear where something should go; and sometimes there just isn't a right answer. You can choose pretty much any two content management systems (or file storage systems), and you'll find data in one that doesn't have a home in the other. The reason for this is clear; every company wants to add value to their software. As each system adds features to try and one-up one another, they create more and more islands of data. For example, as I wrote in a previous post, the Google Drive storage system is a graph. If you try and replicate that graph in a traditional file system, you'll quickly run into a wall. It's just not possible; they are built on different (and mutually exclusive architectures). Data migration may not be easy, but therein lies the fun. Everyone loves a good challenge and those of us here at AppBridge are no exception. If it was easy, we'd probably move onto to some other project. Note: AppBridge will be presenting a session on Google Apps migration at the Google Atmosphere conference in Tokyo tomorrow. Until now, replacing file servers by going to the cloud has presented numerous challenges to organizations, such as security concerns and how to migrate critical data. In this session, we'll explain in detail how to use Google Drive as a file server in the cloud, including how to migrate the data from existing file servers on premises. Observe how data migration occurs in real-time by viewing a demonstration of AppBridge's data migration solution. The number is ever increasing, but over 200 million people use Google Drive for their online file storage needs, and because Drive looks like the other SaaS file storage systems, many people just assume that it works the same way. This is just not true, under the hood Drive is quite different than the cloud storage services such as Box, Dropbox, or Microsoft OneDrive. 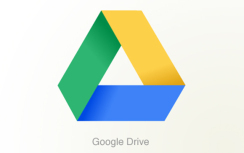 Here are three important examples of how Google Drive is different. When I write that Google Drive is different, I don't mean because Drive isn't just a storage system (you also get Google apps), because it offers the best online co-authoring experience, or even because of the built-in advanced search capability. No, I'm not referring to some marketing interpretation of the different cloud storage systems, I mean the actual file storage mechanism is different. Unlike the other cloud storage systems, Drive isn't hierarchical; it's a graph. Although the term "folder" is used in Drive, they aren't really folders. Just like Gmail, Drive doesn't have folders in the traditional sense. Instead, files and folders are tagged with metadata "labels" and it's the labels that determine where things appear rather than a folder structure. In traditional file systems (including other cloud services), files are "located" inside folders. (People will commonly say "physical folders" even though the entire system is obviously digital.) Continuing with that terminology, Drive files are not physically inside folders; they can be tagged with multiple labels and therefore they can appear to be in multiple "places." You might think that the labels are similar to symlinks or shortcuts, but again that's not a valid comparison because Drive only has labels, whereas symlinks and shortcuts are used to reference traditional folders. When you "move" a Drive file or folder, you're actually changing its labels. This is how you can add a file or folder to your drive so easily and freely move it around. It's not a copy, it's the same file/folder that everyone else with rights is seeing, but it can appear in a different place to each user. This affects the way that sharing works in Drive, but we'll get to that soon. I know that some people believe that copying Drive folders that are syncing to their PC is the same as copying all their Drive files and Google Docs (sheets, forms, etc), but that's false. Google Docs are handled differently than other types of files and one key difference is they're only stored on the Google Servers--the content is not copied to a user's computer during a sync. This can lead to some unfortunate outcomes. For example, the guy who deleted all his Google Docs files because he didn't understand how Drive works. What does this mean for the average user? Not a lot except it's important to understand that Google is backing up these files in their cloud infrastructure. Trying to add some type of extra backup mechanism will not be helpful. Yes, it's possible to download a copy of a Google Doc (e.g., as a Word doc or text file), but that's not something you'd want to do regularly for all the Google Docs stored in your Drive account. There certainly are benefits to the way Google Docs are handled in Drive. For example, Google Docs are not counted against your Drive storage total. This means that you could take a large volume of Microsoft Office documents, Excel spreadsheets, and PowerPoint presentations, convert them to Google Docs and save money on storage space. Of all the differences, the way Drive handles file sharing might be the most obvious to an end user. The ability to send out a link that provides anyone with the ability to view (or edit) a document in a web interface is a super useful feature. I've seen this functionality used in many different ways including a Reddit writing group called Destructive Readers that openly invites members to tear apart each others' work. Yes, it's possible to do this with other file storage services, but Drive is the most popular solution for the group because it's easy to allow everyone to leave inline comments. An important point to remember about Drive sharing is that anyone who has "Edit" access to folders can change the parent folder--including the ability to "move" folders or files to folders that don't have the same sharing rights. In other words, it's easy for a user to make files and folder inaccessible to other people by simply reorganizing the folders (i.e., changing the labels). For more information about Drive sharing, check out this two-part video about Google Drive sharing. Update: The Google Apps Show just added an episode about Google Drive syncing and sharing. Google Drive has certainly grown up quickly. In a recent report about online storage solutions, Forrester praised Google Drive for product strategy and performance, "Google Drive delivers high-performing file sharing and storage services, even for very large formats, such as video, that cross into the hundreds of gigabytes. Most other EFSS providers have file-size limits that could impede advanced requirements." Providing online storage features such as advanced search, access from anywhere on any device, having just one copy of each file, and the ability to organize your files--even shared files--the way you want are integral to the success of Google Drive. However, their modern cloud-based architecture enables some functionality that works differently than other online storage solutions. These are just a few examples, what others have you found? Google has just announced that they're integrating the power of BigQuery with Google Drive. This combines impressive analytical power and speed with the simplicity and convenience of Google Sheets. If you're not familiar with BigQuery, Google describes it as a "serverless fully-managed analytics data warehouse." By providing this new integration, Google makes it simple to add and edit data being used by your queries. 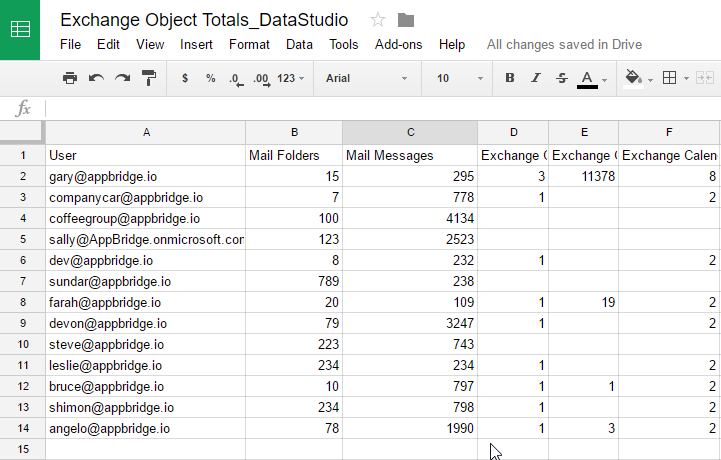 Simply specify a Google Sheet as your table data source and you're done. Changes you make in the Sheet will be immediately reflected in your query results--which can now be saved to a Sheet as well. With big data such a hot topic these days, this functionality could be immediately useful to a lot of organizations. Not to mention all the academics and scientists out there that are looking for flexible ways to get their work done. Save query results directly to Google Sheets from the BigQuery UI. Query files directly from Google Drive, without first loading them into BigQuery. Query Google Sheets spreadsheets from BigQuery as you edit them in Sheets! For more information about this powerful new functionality, you can read the full post on the Google Cloud Big Data and Machine Learning blog. What has changed in content migration since the 90s? Picture a gaggle of eager high school students diligently copying and pasting content from one website to another. That was my first exposure to enterprise content migration. The year was 1999, and the content management system was NCompass Resolution. The mundane manual work was required because there simply wasn't any migration software available; the market for content management was minuscule by today's standards, and migrating websites to Vignette, Interwoven (who featured Lance Armstrong on their marketing posters), or NCompass Resolution wouldn't have supported a serious development effort. So, when faced with the problem of how to get an existing website's content into a new Resolution powered site, the most cost-effective answer at the time was to hire a bunch of worker bee students. Things have certainly changed a lot since then; in fact, they've changed many times over. Software as a Service (SaaS) content management solutions such as Google Apps weren't even a glimmer in a developer's eye, and there would be many steps along the way to reaching the cloud. Each step requiring its own solution to the data migration puzzle. When I look back on those days, I feel fortunate to have landed an entry-level job at NCompass Labs just as "Web Content Management" was breaking out of a humble niche market and into the mainstream. The trend accelerated after Microsoft acquired NCompass Labs in 2001 and rebranded the product as Microsoft Content Management Server (MCMS). Before the acquisition, most of the established content management solutions came from niche players. Big name companies were starting out, but they weren't really in the game yet. That quickly changed with a number of large software companies developing content management solutions--including Microsoft adding SharePoint to the mix. In a few short years, talking to people about content management went from deer in headlights, blank stare reactions to, "Oh, ya. I've heard of SharePoint." While working on MCMS 2002, the team was facing the same migration challenge we had previously solved using the brute force student plan. Hiring students for each project obviously wasn't a scalable solution, so that's when Metalogix entered the picture. The Metalogix team had already been working on sophisticated technology to extract content from websites, and when they impressed the team with a demo, the first migration solution for Microsoft was born: Metalogix Migration Assistant. Since the source system varied, the most logical solution was to extract the content from the browser and then use the MCMS server-side API (which was awesome BTW) to write the content to the target. Most migration software today, does not work like this. It's pretty much one API to another these days. MCMS was a highly profitable business by most standards (it made ~$50 million in its first year), but Microsoft had much bigger plans. Namely, a project code-named Tahoe. 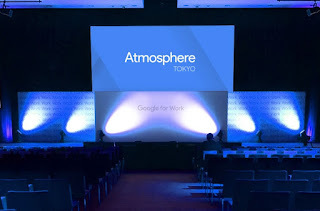 We heard about Tahoe at NCompass, but there was no public demo, so we hadn't seen it yet. Tahoe wasn't just the worst kept secret code name at Microsoft (you'll find numerous references to the 'code name' all over the SharePoint community), it was the beginning of Microsoft SharePoint--the fastest product in Microsoft history to reach $1 billion in revenue (it's currently over $2 billion). Unlike the early days, by the time SharePoint entered the picture in 2003, content management solutions were well on their way to mainstream adoption. There was a rush of offerings from companies such as EMC, Oracle, IBM and many others. At the time, Microsoft Windows was the dominant desktop operating system, so most of the content management solutions were tightly tied to the Windows environment. Yes, many added a web-based authoring interface, but they relied heavily on a Windows-centric view of the software landscape and these solutions--as well as the migration software for them--were simply not well-suited to the coming revolution now known as cloud computing. Not surprisingly, when Microsoft folded the MCMS team into SharePoint, Metalogix was already working on a migration solution for the new product. (Metalogix's SharePoint migration products recently finished in 1st and 2nd place in a favourite SharePoint migration tool poll.) Over the various incarnations of SharePoint, migration Independent Software Vendors (ISVs) had to adapt to the changing technology. For example, SharePoint eventually added a SOAP-based client API, but it did not provide the same functionality as the server API. This complicated matters since migration vendors all wanted to support both on-premises and hosted installs. Although network connections were getting faster and more reliable, speed was definitely still a major issue for migrating data to and from the cloud. A decade later, many on-premises services rose to the cloud, and many companies were scrambling to deal with the new reality. Microsoft chose to adapt SharePoint to the cloud, first releasing the Business Productivity Online Suite (BPOS) which was a slightly modified version of the on-premises technology, and then later grouping a number of SaaS offerings together as Office 365. Developers working on migration solutions for the cloud had a difficult time adjusting to the new paradigm. By this point, content management solutions featured more friendly REST APIs, but most product APIs simply didn't provide enough coverage for high-fidelity migrations. Originally, Gmail, Google Drive, and the other Google Apps targeted the consumer market. However, with the release of Google Apps for Work, Google evolved their offering into a full stack solution for the enterprise. 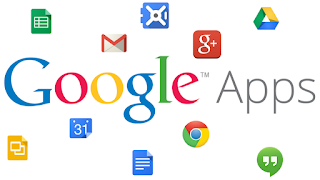 Unlike older content management systems, Google Apps wasn't rooted in the on-premises days, and this allowed the team to create something more modern and better suited to today's mobile-friendly tech environment; for example, with the ability to co-author in real-time in a web interface or mobile app. As Google expanded their apps, AppBridge was founded on the goal of helping companies go Google. Using new technology to achieve greater scale than previous migration software, we now offer full stack, zero downtime migrations to Google Apps via the AppBridge Transformation Suite. It is clear that cloud computing has been accepted by large organizations of all types and verticals. Data networks have improved significantly and many people have fast network access at home and work. many barriers have been removed, and the benefits of the cloud--especially the economic and security improvements--have outweighed the outdated value proposition of buying and maintaining on-premises equipment. Without a doubt, there will be surprises down the line, but it's clear that the overarching migration to the cloud is only just starting to gain momentum.